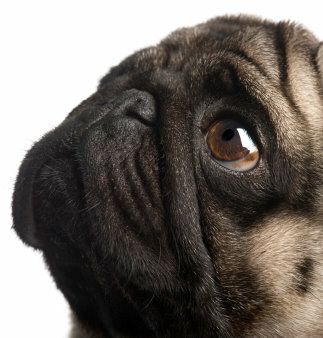 Should You Get Pet Insurance for your Pug? Not too long ago pet insurance didn’t exist. It does now and is becoming more and more popular. Should you get it for your Pug? As with almost any insurance it depends on your situation. It pays to do some research and read carefully what is covered and what is not covered in any policy. Insurance companies are in business to make money so most people will spend more on the insurance than they do on the money the insurance company pays out for the covered procedures. But, insurance can be a smart investment over the life span of your Pug and getting him covered early can eliminate the pre-existing condition clause that most insurance companies have. More and more veterinarians are accepting pet insurance and it would make sense to do the math to see if this will be a smart thing to do. As part of this process you will want to get a full list of the procedures that are covered by the policy that you’re buying. Sit down with your vet and see what paying for the procedures that are scheduled in the coming year and see how much of a difference there will. Don’t be surprised that it could cost less just to pay for the procedure out of pocket rather than with the insurance. So, why would anyone get insurance for their pet? It only takes one major illness or surgery to make your insurance policy look like the smartest thing you ever did. Only you know your financial situation. What would you do if something happened to your Pug that required surgery and you faced a bill of a couple of thousand dollars? That’s a tough question and the only one who can answer that is you. Insurance companies can be found online and many of them will tell you exactly what is covered and how much they will pay and how much of a deductible there will be. Make sure your veterinarian takes that particular insurance and then make a decision. If you are thinking about alternative medicine for your Pug be clear on what is covered and what is not. Insurance policies are something that you purchase with the hope you will never need to use it. That’s not only true with humans, it’s true with your Pug too!